Fresh off the awesome success of Toy Story II, yet challenged by DreamWorks' recent blockbuster, Shrek, the animation tech wizards at Pixar return with a new story about the largest terror factory in the world: Monsters, Inc. At their nightmare headquarters, night terrors work at being the scariest, most intimidating creatures to ever pop up in a child's dream. Alas, the industry is brought to its knees when a little girl named Boo finds out that, despite what her parents have told her, the monsters under her bed are real. Also, she discovers that there is a portal she can use to follow them over to the realm of dreams, a place where the most terrifying idea imaginable is...a human child. Top scarers James P. Sullivan (voiced by John Goodman) and Mike Wazowski (voiced by Billy Crystal) have to deal with the repercussions now that the hunters have become the hunted. Vital statistics for Monsters, Inc. Awards page for Monsters, Inc. 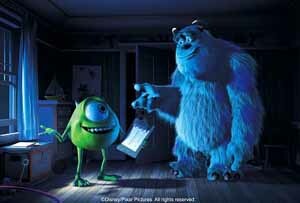 Comparison films for Monsters, Inc.